I am breeding for 'pretty rabbits' who are excellent pets. They are not all purebred rabbits and I'm upfront about that. I do hope to breed for quality as well, but that will take some time. If they produce the occasional kit who looks nice enough, and I don't want to keep it as a breeder, I will offer it for sale to the show community and they can take it or leave it. I like what you just said here. As a show breeder, I find that acceptable. You are breeding because you enjoy it, with a goal of temperament, and then beauty, but you also plan to be mindful of breed conformation. You have a plan for those you don't keep as well. to be honest, as a show, fur/fiber, then meat breeder, temperament is not #1 on my list. It's reason #2 why I rarely sell pets, my rabbits aren't pet material. Some one has to fill the need. Mostly it's by show breeders and their culls, but also by people who aren't directly interested in showing that responsibly breed whatever they breed. My two purebred Mini Lop does, who I bought specifically for breeding, leave something to be desired as far as personality goes. If I had met them before I purchased them, I would have waited for friendlier rabbits. They're not MEAN rabbits, and they are easy enough to handle, once you pick them up, but they're not FRIENDLY rabbits. One of them is fairly relaxed now, the other one is still fearful of people. Neither one enjoys being handled. I honestly don't know how much of that is genetic and how much of that is simply because they both come from show stock, rather large breeders who don't spend a lot of time socializing the kits they breed to sell. I guess I'll find out. If the kits are not friendly, we're going to end up with a lot of meat in the freezer and I'll be looking for new does. Oddly enough, raising the price often causes more demand, especially in an area with a good market. I guess people think that a 25 dollar rabbit is "better" than a 15 dollar rabbit. I'd not worry about people who price lower than you. They can complain all they like or raise their prices. Temperament is hereditary and environmental. I spent a lot of time with my kits, I pull nest boxes and handle them from birth. Still, many are not particularly interested in me, and some are down right mean. Almost all of them allow me to handle and groom them, I cull ones that don't, but I can tell they would rather be left alone. On the flip side, a friend I sold rabbits to, her kits were extremely interested in me. The herd sire was an extremely friendly buck, and he has bee gone more than a year, but when I saw him, he greeted me at he door. (I sell the friendly ones and keep the uglies for myself). I am making some progress, but type trumps temperament, so I don't go too far. skysthelimit wrote: I am making some progress, but type trumps temperament, so I don't go too far. Yep- you can only focus on certain things at the same time, so you have to pick what is most important to you and work on that first. My Rex are very sweet, their type is improving as I cull out long and/or low shoulders, and now I am working on improving fur density. My Satins are demon rabbits but have excellent type and fur. If I get scratched by an older junior or a senior rabbit, I can guarantee it was Satin that did it. My Satin lines are very high strung, while my Rex are super sweet. Temperament in breeds varies according to the lines though- some people have psycho Rex and sweet Satins, so it depends on where you are and what the local breeders are selecting for. The Silver Fox were extremely skiddish ( but not psycho). The Angoras are grouchy. 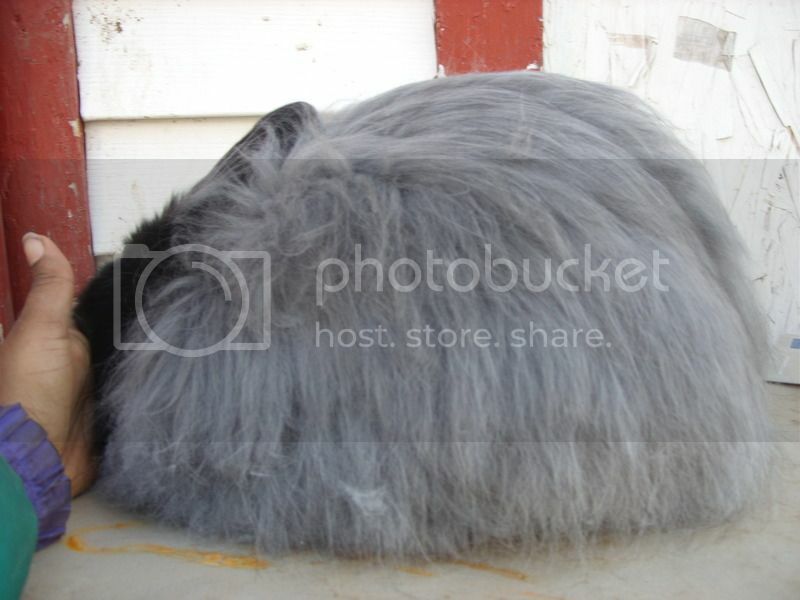 Too grouchy for such a large rabbit that needs to be groomed frequently. The worst part is just getting them out of the cage, then they complain about the trip to the table, about the noise of the blower, about the weather... they bang on feeders and rattle cage doors. They sit still the whole process, even while I'm clipping, but they complain. Evil Mini Rex? I'm sorry, that just doesn't sound right. funnies50 wrote: Evil Mini Rex? I'm sorry, that just doesn't sound right. Like little nightmares. Like the the beautiful geisha ladies who were secretly assassins. I have on my business cards that I raise Flemish Giants and Mini Rex. I also raise Lionheads, some pedigreed, some not, Holland Lops, I have Harlequins that aren't pedigreed, and then I have a trio that are, and then I have my pets. My pets are Harlequin Dutch, and just recently, i've tried to do pet mixes. I have ( Hopefully) Lionlop/Dutch, Lionlops, and Dutch/Mini Rex. I have never had an issue selling them. If I have ones I can't sell, I lower the price. I never make it any lower than the cost of A bag of feed, which is $15. My Flemish NEVER get discounted. They take way too much to raise, and the does are hard to get bred. I sell those for $115 pedigreed, $100 pet. Never any lower. Also advertise sometimes, ones that won't move, that they are a special price for 4h kids only, and I will only sell them at that price with proof of membership. I think if kids don't continue the hobby, no one will. Just a thought. Selling QUALITY Pedigreed Rabbits and Family Bunnies in Lancaster, Pennsylvania! Please feel free to give our Facebook page and website a look!